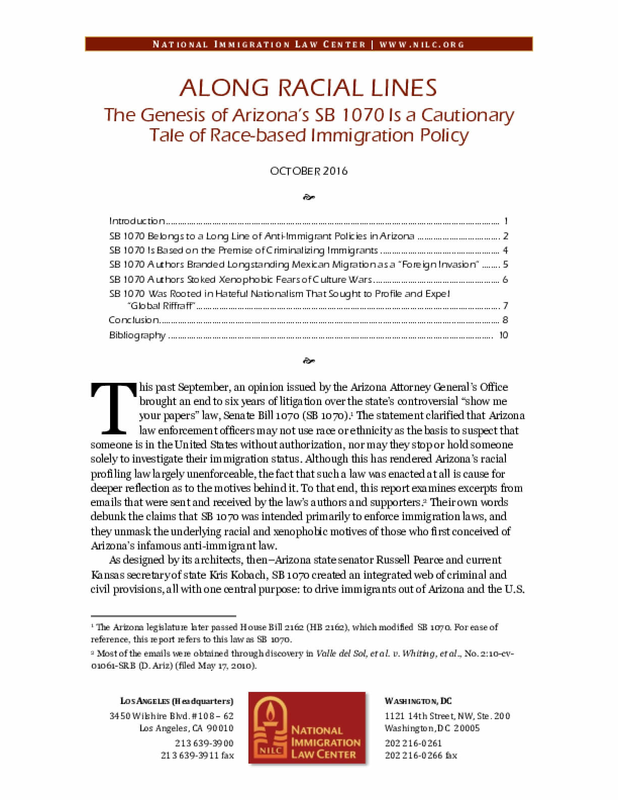 For the authors and supporters of Arizona's most notorious anti-immigrant law, SB 1070, the existence of the United States as a nation was being threatened by unauthorized immigration. Specifically, this threat was understood to come from immigrants entering the U.S. from Mexico. Their argument claimed that the nation could be saved from this threat only through the strict and punitive enforcement of the country's immigration laws, even by way of flagrant racial profiling. Using the words of the very individuals who authored SB 1070—and of those who share that worldview—this report unmasks the underlying racism that motivated such an egregious law. Copyright 2016 by National Immigration Law Center. All rights reserved.